The founding of Nollendorf 674 m above sea level (base of the church) directly on Erzgebirgskamm was already around the year 1100, about the same time with the places Zinnwald and Graupen . Nollendorf was a Waldhufendorf with 35 hooves. Nollendorf owed its foundation to the surrounding gold and silver deposits. One document said that trout had been found in the bowels of trouts caught in Grabenwegbach. This caused Harzer and Thuringian miners to migrate to the Erzgebirge Ridge in order to first sift out the gold and silver granules from the sand and rubble moraine. Later, not only silver ore but also iron and chalcopyrite, galena and sphalerite were mined in small tunnels and in the “blessing of God” mine. The Zechberg, 792 m high, had gotten its name through this colliery. Originally Nollendorf reached between Hornkuppe and Schielhaushöhe up to the Zechberg. The village stretched from Keiblerberg down to the foot of the Wagnerberg at Königswald . The wooded gorge below the village called the miners after the Middle High German word telle , In Tellenz or In Tellz . This later gave rise to the name Tellnitz for the neighboring village lying in the valley. Because the miners lived on the mountain, they called their place of residence Nollendorf, derived from Nolle (mhd = tip or hill). In German dialect, the place until the last still pronounced “Nolndarf” or “Nolndorf”. The climate in the upper part of the village was very harsh but healthy due to the high and exposed location. Dense fog often occurred. The climate in the lower part of the village was much milder. The inhabitants were largely fed on the crops of agriculture. Rye, oats, potatoes, cabbage, turnips, vetches and clover were grown. While apples, pears, plums and cherries flourished in the lower part of the village, in the upper village at most the wild cherry trees were found. At the end of the 19th century, craftsmanship satisfied the most necessary needs. In the lower village stood a mill. Part of the residents operated velvet weaving, whose products were delivered to Königswald and Peterswald . Also with hops was traded. Nollendorf gained great importance due to its geographical location on a Erzgebirgspaß, which gave it its name. One of the oldest ways that connected Bohemia with Saxony, led across the village. The streams “Luhpuhc” near Nollendorf and “Olesnice” near Peterswald were signposts through the then dense border forest. This path also formed the western border for the ” Johanniterwald “, which had been given in 1169 to the Order of St. John the Knights by King Vladislav of Bohemia. At Nollendorf ended the Erzgebirgewith its granite and gneiss formation, and it began the Elbe Sandstone Mountains . Around 1310 the Lords of Lungwitz (from Saxony) became owners of Nollendorf. In 1404 they exchanged this property for a good at Doppitz with Wenzel von Wartenberg on Blankenstein. The Wartenbergers were interested in Nollendorf for strategic reasons because they were able to observe the villages of Peterswald and Schoenwald from the Nollendorfer Heights , which at that time belonged to Meissen. From 1495 also Nollendorf was under the diocese of Meissen . In 1506 Nollendorf and Peterswald came to rule Graupen , In the list of possessions of the rule Graupen, dated January 20, 1507, among other things, the Klatower Meierhof is called. With Klatow today’s Nollendorf should have been meant. Only in a later directory (1537) is the place expressly called Nollendorf. 1648 – 1923 2 After the Thirty Years’ War (1618-1648), only 16 of the 35 existing farms in Nollendorf were inhabited. In 1787, however, 72 houses and 1880 even 96 houses were inhabited. With the growth of the population the arable land soon became scarce. Only about a quarter of the population could live from agriculture, the rest had to seek their livelihood with other work. For example, Nollendorfer residents made many items for daily use of wood and straw and sold them in the area by “peddling”. Also much was knitted. Most of these products were sold abroad. In the summer, the men were traveling with brigades as masons, carpenters and roofers and often earned their bread far from home. But there were also charcoal makers, buckle and button makers, stonemasons, dyers, millers, bakers, bar owners, carters, hay, grain and hop traders. It should be noted, however, that there were also poachers and Pascher (smugglers) in Nollendorf. Even a “Pasch king” had Nollendorf once. In Nollendorf lived about 1860 about 700 people, 1880 there were only 454. The reason of the decline of its population was the emigration of many Nollendorfer in the emerging industry and coal mining to Aussig and Karbitz, but also to Saxony and to America migrated Nollendorfer out. Mechanization and automation during the Industrial Revolution meant that many homeworkers became unemployed. At the same time, new factories were built in the towns of Peterswald, Tyssa and Königswald, which provided work. 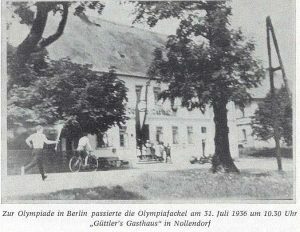 Also in Tetschen-Bodenbach and in Aussig Nollendorfer found their jobs. More than Peterswald Nollendorf benefited from tourism. In 1913, on the occasion of the centenary of the victorious battles in its vicinity during the Wars of Liberation, the mountain club Aussig on the Nollendorfer Höhe (701 m) built a lookout tower, the “Kaiserwarte”, which was renamed “Karl-Weis-Warte” in 1923 , With the construction of this tower and the construction of the tram from Aussig to Tellnitz in 1912 Nollendorf had become a new hiking destination of the Aussiger. The emergence of winter sports also contributed to the fact that in 1923 by the tourist association “The Friends of Nature”, section Aussig, connected to the “Association of German Youth Hostels”, Nollendorf No. 42, the “Naturfreundehaus Nollendorf” was established.